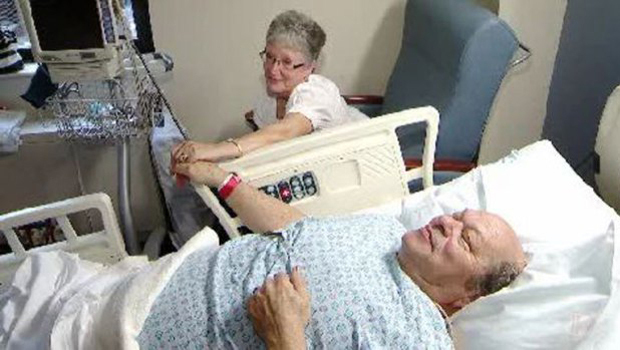 PITTSBURGH - A couple who first met 36 years ago and reconnected on Facebook got married in a suburban Pittsburgh emergency room after the groom suffered a heart attack on the way to the wedding, CBS Pittsburgh reports. Bob Adams was 15 minutes away from his marriage to Mary Pizzuto when the 68-year-old realized he was having a heart attack. "And I started feeling a little funny," Adams said. "And I thought it was because I was dressed in a suit and tie, which I never wear." He popped a nitro pill, not wanting to let anything stand in the way. "He said that he was getting married one way or another, no matter what," said one paramedic Rob Leuthold. "He wanted it to happen." But the EMTs who responded insisted they go to the hospital. Adams rode in the back of the ambulance with a heart monitor, IV and medication; his bride was in the front. "She was a nervous wreck," said EMT Beth Walter. "She was up front and an absolute nervous wreck." Pizzuto's family was worried also because she has had five heart attacks. But the couple, who found each other after Pizzuto's great-niece put her picture on Facebook, was not going to let Adams' heart attack stop their nuptials. The preacher arrived and they got married in the emergency room. "The preacher come in and the thing I said was, 'We're not doing the last rites - we're doing a marriage,'" Adams said. "And everybody bust out laughing." Adams is recovering from successful angioplasty and the couple plans to spend their honeymoon in Las Vegas. In the hospital room, Pizzuto leaned over to give Adams a kiss and he said, "That's my baby."